Modern technology is oriented to maximize ease of life in very different ways. Nutrition is perhaps one of the most important areas of life, so all sorts of technical devices in this field are improved every day.Consumers just don’t have a time to follow the news that appears on the market. We will talk about Multi cooker- device that came on the shelves of home appliances shops quite recently today. I have written about the interesting features of such device as electric steamer in one of the previous article. You can often hear the question: “What is the difference between Multi cooker and steamer?” It means that people are interested in opportunities of Multi Cooking, but they know not enough about them. Well, let’s try to understand how to buy a good Multi cooking. Let’s understand what is a cooker first. A multi purpose cooker is a multi-functional appliance, designed for automatic cooking. This appliance has received the prefix “multi” due to the presence of a large number of functions related to cooking. Multi cooker history can be started from the 17th century, when one French engineer invented a device for rapid thermal processing of raw sugar. It was the first ancestor of many modern appliances, including Multi cooker. Modern Multi cooker structure is relatively simple – it is actually sealed pan that is placed in a special housing with heating element, whose work is regulated by the control program. This characteristic is one of the main, like for all electrical appliances, especially if they use heating elements. Multi cooker power affects the strength and rate of heating, and consequently the time of preparation. Power determines also how much electricity Multi cooker will consume. Multi cooker power is in the range from 450 to 1400 Watt mostly. 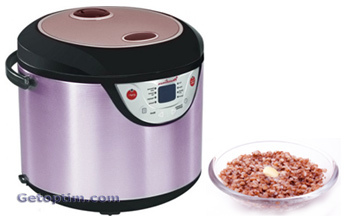 If you plan to use Multi cooker from time to time you can choose a model with 650 watts power. If you plan to cook with it Multi cooker every day you will need 850-900 watts power. Sealed pan (bowl) in which the products are placed for cooking is one of the main Multi cooker parts. Quantity of food which you can prepare depends on the volume of bowl. Multi cooker bowl can have a volume from 2 to 6 liters most frequently. You should focus on your food needs when selecting the bowl volume. We can recommend Multi cooker pan with 4 – 4.5 liters volume on average. The interior of the pan is the main contact area, so its coverage plays an important role. Non-stick pan coating is used in most Multi cooker models. This coating has several layers in more expensive models, for example “marble” coated, which is characterized by greater resistance to mechanical damage. 4. Number of programs (modes). Multi function cooker work is regulated by program with a special microprocessor, as we have noted above. Each program (mode) is optimized for a particular cooking type, for example pilaf or potatoes, and therefore it is often called – “Pilau” program or “Potato” program. Multi cooker modes determine cooking time, heating temperature and several other parameters. If the appliance has more modes, it can cook a more variety menu. Multi cooker can have from 3 to 8 or more programs. “Steam cooking” mode is often included in the list of programs. Thus, we can answer to the above question about the difference between Multi cooker and steamer that Multi cooker has more functionality and steaming is only one of its functions. “Baking” mode is also very interesting. Multi cooker takes functions of bread maker in this case. – Timer. The timer help to use such Multi cooker function as “delayed start“, with which you can set the time when appliance will automatically start cooking. – Heating of ready meals. Heating function helps to maintain the desired temperature of already finished dish. – Steam removal system. Quite hot steam can be formed during cooking, so most models are equipped with a special steam valve. This valve can gently remove steam from Multi cooker and increase safety of use. You should also pay attention to the Multi cooker size, weight and to the usability of the control panel. We can say that Multi purpose cooker is a really useful thing in the kitchen in general. If you will use all its functions, it can replace a variety of other home appliances.